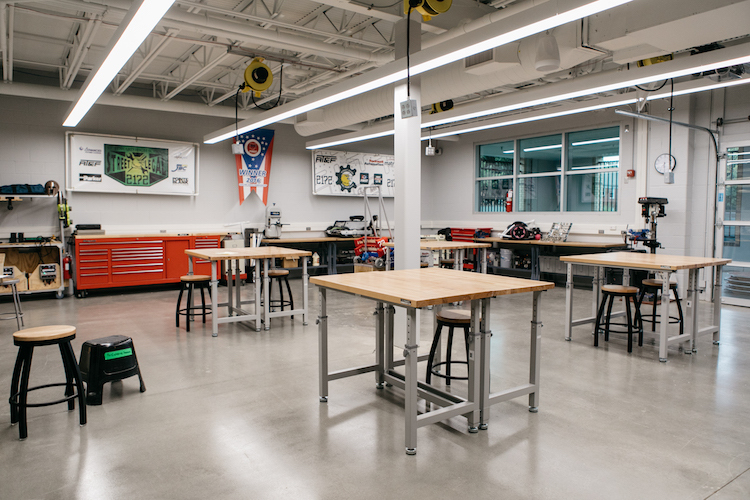 St. Edward High School's newly-unveiled Joseph & Helen Lowe Institute for Innovation is already driving students to give back to Cleveland with an ambitious project: transitional, affordable housing for the homeless in the form of upcycled school buses. Lowe Institute for InnovationDuring a brainstorming session in the fall of 2017, students drew from their past experience in building affordable housing during an annual trip to Appalachia with the aim of bringing a similar idea back to Cleveland. Their vision is called the "Rutu Home," which will cost 74 percent less than the average tiny house. To kickstart the project, the school is currently seeking funds via grants and private investors to build out the first housing prototype—which students aim to produce within a couple months once funding is secured. St. Ed's students sitting on the lounger seatThe goal is to have a functional prototype in place by May 2019. In the meantime, students have been finding ways to reuse every part of the bus. Prototypes for bus seat loungers currently are being constructed, with positive feedback. “We can convert a bus seat into a pretty nice and comfortable lounger and sell them for $150 to $200 retail, which would also fund the project overall,” McKenna says. Once the prototype is completed, the school plans to partner with local nonprofits to bring housing to Cleveland families in need.